About 3 weeks ago I had to run over to our new place to get a few pictures of the slab. The bank needed me to text them over. So I left the house about 30 minutes early and parked by the road, choosing to walk to the house rather than bother with the gate. Pictures taken on my phone, I was almost back to the car when a huge, soft shadow passed right over my head. I peered up into a small pine and there he was. The most lovely, somber-eyed creature in the forest. I just happened to have my camera in the front seat. I eased over the gate, told Addie to hush and eased back to the tree. He was still there, daring me to take his picture. After this, I motioned for Addie to come see him. He was so patient and, well. Superiour acting. I will give him that one. He finally flew into a taller pine, and watched us as we left. 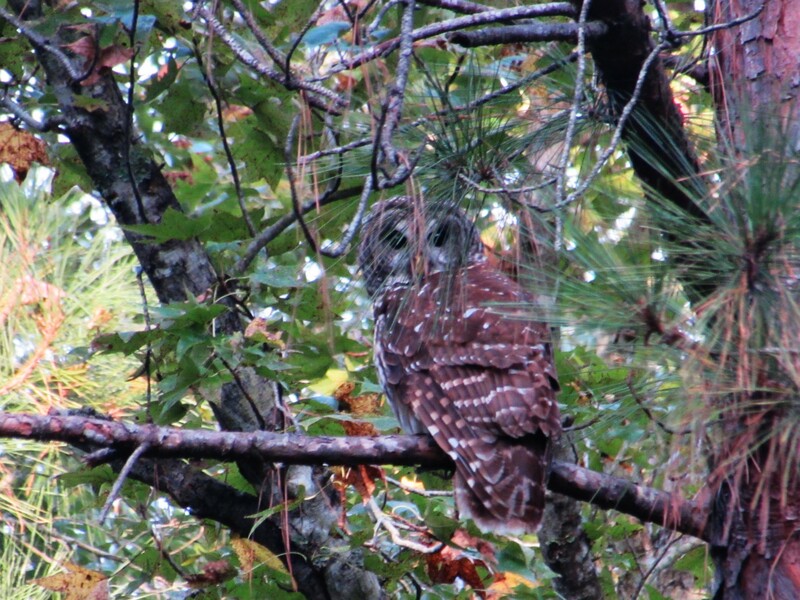 I am happy to report, since these pictures were taken, the owl has been seen 3 more times. I guess we are going to be neighbors. Therefore, since all neighbors need names……I am calling him Archimedes. Because, you know, the Sword and the Stone. Classic Disney, people, Classic Disney. ← And the forest smells…like mushrooms. Wow! Cool picture! 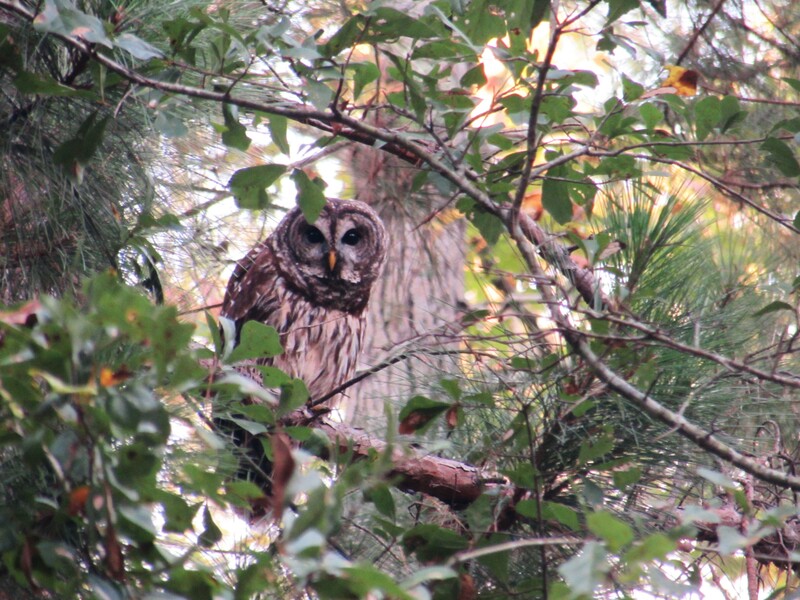 He didn’t give a “hoot” whether you took his picture or not! Archimedes rules! Yes indeed, he rules! I’m so happy he lives there, a long as he doesn’t bother my chickens, we will be good friends! I love it! 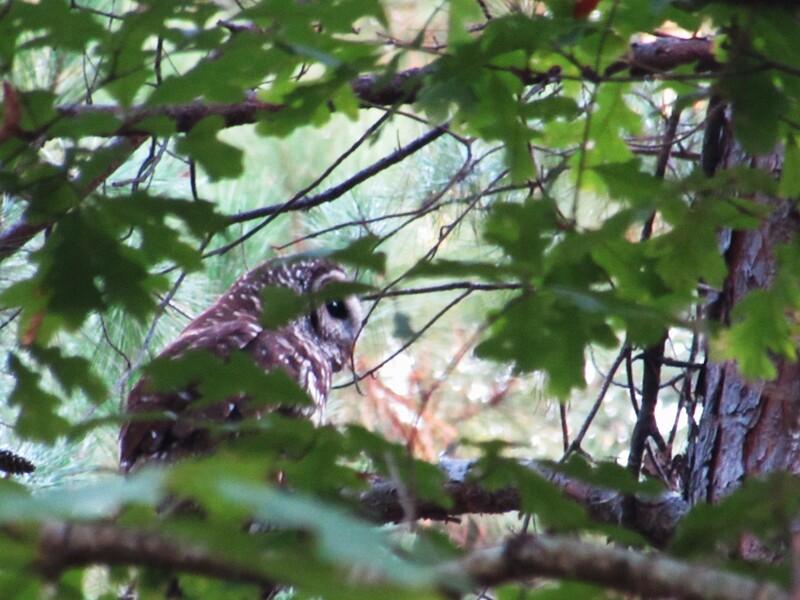 We have Barred owls in the woods and everyone had seen them but me. Glad he let you creep up close!